If you receive a wage or salary from a company, you’re a W2 employee, and your income and withholdings are relatively easy to handle when it comes time to file. But if you have any other income aside from your paycheck, then this is a sign you shouldn’t be filing your own taxes. Whether you run a business from home, do freelance work on the side, or sell homemade products online, that income needs to be handled a very different way than your monthly paychecks. Plus, there could be business deduction you’re not taking advantage of that may save you a lot of money on your taxes. We list this separately from “other income,” because the income from a rental property is handled very differently from small business or freelance income. Taxes related to rental properties are extremely complex, regardless of how straightforward you might think your situation is. In fact, most tax experts will tell you that how your rental property is taxed is one of the most complicated parts of tax code, so you definitely shouldn’t try to handle it alone. Things can get even more complex if you lived in the rental property for any time during the tax year, if you purchased anything for the property, or if you suffered any losses related to the rental, like severe damage from fire or flooding. If any of this has happened to your rental property, immediately hand it over to a tax professional. If you’re a college or trade school student, or you have a dependent who is a student, then there are several different kinds of deductions and education credits that you can claim on your tax return. However, understanding which credits and deductions you qualify for is not easy, so if you want to get the maximum benefit, you should be letting an accountant handle your taxes. When your life changes drastically, the way you file your taxes can change as well. Whether you’ve gotten married, bought your first house, had a child, gotten divorced, or been widowed, all of these events have a huge impact on your taxes as well as your life. Even if you’ve been confidently doing your own taxes up to this point, it’s a good idea to have a tax professional handle your next return after a major life change, so you can ensure you get all the deductions and credits you now qualify for. For example, if you’ve just had a new baby, there are many tax breaks you qualify for as a new parent: the Child and Dependent Care Credit, the Child Tax Credit, and the Earned income credit, just to name a few. Learning how to handle all of these new tax credits can be very difficult—especially if you’re doing it on three hours of sleep, thanks to your new little addition. 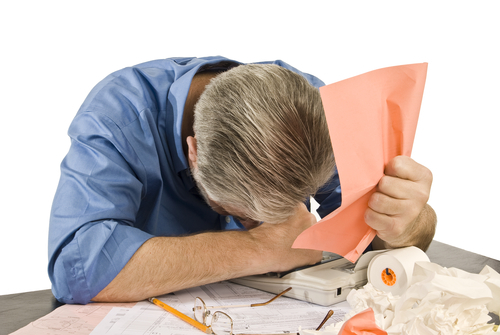 Failing to file a tax return is a fast way to make your life more complicated. However, many people will do this to try to avoid receiving a large tax bill. If you’re someone who has any unfiled returns in the past, you should immediately seek the help of an experienced tax professional. They can prepare those past returns for you, but more importantly, they’ll help guide you through any hassles with IRS and can even work to set you up on a payment plan for your overdue taxes. As appealing as low-cost DIY tax programs might sound, they’re really only effective for the simplest of tax returns. If you’re like most people, your tax return (and your life) is much more complex than these programs are capable of handling. So, if any of the above situations applies to you, be sure to turn your tax return over to a tax professional, so you can ensure you get every credit and deduction you qualify for.